For 2019 we’re going to tweak the formula slightly, but the basics will be the same: only your best 3 seasons of any given game count and you get credit for all the league points you earn plus bonuses for winning games and winning your group (where the bonuses scale up depending on how difficult your division is). We feel this worked pretty well (especially for a first attempt), but the one tweak we want to make is to reward folks for maintaining their position in the higher divisions: 2nd place – 5th place in Division 1 will now receive 5 bonus points and 2nd – 5th in each Division 2 Group will earn 2 bonus points. We don’t have separate official awards for each of our 5 online games, but that’s not going to stop me from pointing out who our highest scorers were. I’ll be looking at aggregate scores here (aka, the sum of your best 3 seasons) since that’s what counts toward Player of the Year. Allan scored 144 of his points in Brass, which was tops. Jon Wilcox pipped Maciek Dud 136-135 for the second best Brass year. Brass has proven to be our fastest game, by the way, with 7 different seasons happening during 2018. Andrew Emerick and Scott Rothstein rounded out the top 5 with 115 and 111. Eric Freeman had the best year in Castles of Burgundy, winning Division 1 in 2 of the 4 seasons that happened in 2018 to take home 135 points. Allan had to settle for 2nd here, with 119.5 points as he worked his way up the ladder, while Andrew Norgren was 3rd with 117, Ming Wei Liem was 4th at 112, and Chris Bert was 5th at 111. Switching to the app for Through The Ages helped us get in 5 seasons over the course of 2018. Allan spent all 5 in Division 1, winning it twice, but his 142 points was actually 1 less than Eric Krasnauskas (aka Kolo), who only played 3 seasons but won all 3 of them, climbing from Division 3 up to Division 1 (which he won last season). Eugene Harvey was 3rd with 122. Only 2 others broke 100 points: Luis Leitao (104) and Ray Fernandez (103). To the surprise of absolutely no one, Kyle Smith earned the most points in Thurn & Taxis (with 124). No one else has won Division 1 more than once, but Kyle has won it *5* times, including in 2 of the 4 seasons that happened in 2018. Other games have had 3-time winners (Eric Freeman in Castles and Petri Savola in Agricola), but Kyle’s dominance of Thurn & Taxis is the most complete of any online Meeple League game. Rob Kircher’s 112 was 2nd for 2018 while my own 102 was 3rd. Alex Bove was 4th on 99, meanwhile with 98 points and 5th place overall this is apparently Allan’s worst game! Agricola seasons are our longest and there were only 3 in 2018, so there was no opportunity to ignore a bad season. Manpanzee was the clear winner with 139.5 points. Having won his Division 4 group in late 2017, Elliot started 2018 by winning his Div 3 group, then won his Div 2 group, then won Division 1! Allan was 2nd with 114 as he also completed his own rise up the ladder into Division 1. 3rd place for the year was a tie between William Francis and ecotone at 105.5, with Terry Borer being the only other players to break 100 (which he did half half a point). All in all 2018 was a very successful year for us – lots of people got to play lots of board games. Here’s hoping 2019 is even better! Michael Kiesling’s tile drafting game. Published in 2017 by Next Move Games. For more information see Boardgame Geek and Next Move Games. 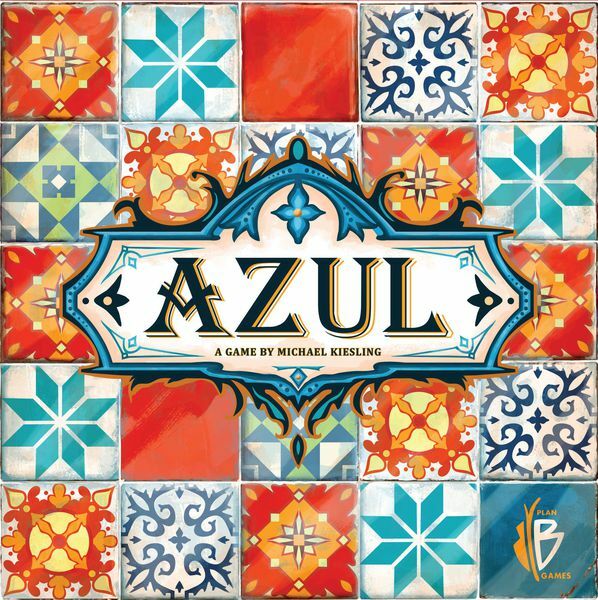 Azul is a sanctioned game for 2019! Watch for event announcements. This is the home page for a Boardgame Players Association “Play By Email” tournament for Agricola in 2018. It is open only to members of the Boardgame Players Association (BPA). It you attend the World Boardgaming Championship (WBC), and are up to date on your registration fees, then you are already a member. If not, you can purchase a “PBEM Membership” for $10 from this website: www.boardgamers.org. This tournament will award laurels and contribute to the annual Caesar award, all of which is tracked through that same website. All games will be 4-player games using the tournament mode and draft 7 settings on boiteajeux.net. Heat Stage: Everyone who joins the event will play in 3 asynch games, which will launch simultaneously. They will be paired randomly within the constraint that we will do our best to avoid putting people into multiple games together. If you win any of your games, you advance to the playoffs. Semifinal Stage: You will be placed in 4 simultaneous asynch games. They will be seeded based on the results from the Heat Stage as much as possible (details will depend on the number of semifinalists who qualify). In addition, we will avoid giving anyone repeat opponents if possible. You will be awarded 10 points for winning a game, 6 for finishing 2nd, 3 for 3rd, and 1 for 4th. The top 7 point-earners will advance to the finals, with heat performance serving as the first tiebreaker and percentage of winner’s score in the semifinals as the second tiebreaker (and from the heats as the 3rd tiebreaker). Note on Ties: We will not use the in-game tiebreakers for finish positions. In the heats and quarterfinals, anyone tied for 1st gets credit for a win. In the semis and finals the points for tied positions will be divided evenly among the tied players. Pace of Play: You are expected to check your games and take your turns (at least) once per day. It’s OK to have an occasional break of a couple of days, but we expect most games to finish in less than six weeks. Games that haven’t finished in 2 months are likely to be adjudicated, and the adjudication will include demoting slow players to lower finish positions. Games will be played on Boiteajeux.net using the Tournament Mode (aka, there is the usual banned list) and Draft 7 settings. As games end the standings are updated. See how each player is doing and check on your friends and rivals. The winner of each game should record the results, unless otherwise arranged. Use the form below. If you have problems using the form on this page CLICK HERE TO SEE JUST THE FORM. Game Assignments for the Heats are posted below. Each player should be in exactly 3 games (with no overlapping opponents). The games listed below are the 2018 Meeple League games for live events. Tournaments in these games will be sanctioned and tracked all year starting with our kick-off events: Total Confusion 32 and PrezCon 25, both in February. Terraforming Mars and Great Western Trail are new this year. All the games have run multiple seasons and have or will be soon starting their 2018 Year. At the end of this year, a 2018 Online Player of the Year will be determined. Watch for details (but playing a lot helps)! PrezCon has a large lineup of tournaments, vendors, and a well-stocked open gaming area. The Doubletree keeps everyone well-fed and the attendees are very friendly to newcomers. Prezcon will be running all 9 Meeple League games. And then I realize that I already do something like that. It’s called PrezCon. The Summer Nationals are a smaller version of the winter event, but you can expect to have a similar experience. To get an idea, check out this trip report. How Do You Get Meeple League Points? To determine player standings across events for each of the Meeple League’s featured games every year, points are awarded based on how well the players do. Here I will explain how the points are determined. First by just playing in one game of a tournament you will get your first point. Next, if you win any game during the tournament you will get 3 more points. If your tournament has a semi or quarterfinal, just for playing in those rounds you will earn additional points. Lastly, if you get to play at the final table you will get more points for the place you finish in. Now, the number of points for playing in the quarter/semi/finals of a tournament will depend on the total number of different players entered into the tournament. For example, let’s say that you play in a 37 player Ticket to Ride tournament and you finish 3rd overall and the tournament includes a semifinal round which you win. You would get 5points for playing in the semi, plus 18 for finishing 3rd overall. Your total for the event would be 27. The other 4 points are coming from entering and winning a game during the tournament. * Only awarded if 5th and/or 6th player in final game. Use this form to report the final results of each game. You should receive an email copy when submitted.